In part two of his look at footballing phoenixes, Dave Burin writes about three more clubs who have had interesting recent histories. For most football fans, the name Jimmy Glass conjures up one of football’s most wonderfully dramatic moments. The Carlisle United goalkeeper’s instinctive finish to slot the ball into Plymouth Argyle’s net, in injury time, on the final day of the season, to keep the Cumbrians in the Football League, remains one of English football’s most incredible moments. But for Scarborough F.C., it was their one-way ticket to the Conference Premier. The men from the McCain Stadium – known locally by the wonderful moniker of the ‘Theatre of Chips’ were back in non-league football. There followed a short period of stability. Russell Slade oversaw an incredible turnaround in 2001-02, to steer a seemingly relegation-bound Scarborough side to a respectable 12th place finish in the Conference Premier. 2003-04 saw the club welcome Chelsea to the seaside in a close-run FA Cup tie, whilst the following campaign saw the improving Seadogs go the whole campaign unbeaten at home. Despite previous glories in non-league, including three FA trophy wins in a single decade (1973, ’76 and ’77 respectively), this time Scarborough would not see long-term success. The chips were certainly down when it came to the club’s attempts to move from the McCain Stadium. The club were unable to legally sell the stadium’s land for any non-sporting purpose, and unable to convince the council that a move could clear the club’s debts, the club was dissolved in May 2007, shortly after winning their final ever match, with a 1-0 away victory over fellow Conference North side Hucknall Town. Even without dissolution, a 10-point deduction meant that Scarborough would have suffered a second relegation in successive years. A fresh start, or rather two of them, came in the shapes of Scarborough Town and Scarborough Athletic. Town seemed set to be a great success, winning the Wearside League at the first attempt in 2009-10, but as with their predecessors, the Phoenix club were wound up due to issues with their ground. 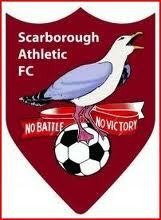 Scarborough Athletic, now established in the Northern Premier’s second tier, are currently based in Bridlington, but looking for a return to Scarborough by 2016. Though they may like to be beside the seaside, the stadium struggles of their comrades mean it’s a decision which Athletic should not take lightly. Built as a vanity project by former Darlo chairman George Reynolds, a man so terrifying that I won’t insult him directly, The Darlington Arena remains one of English Football’s most infamous examples of overspending. Holding 25,000, in the club’s relegation season of 2009-10, Darlo averaged a crowd of under 2,000. Rewinding back to the summer of 1999, whilst Scarborough were dropping out of the Football League, the Quakers were sat comfortably in mid-table of Division Three, when Reynolds, a mega-rich career criminal entrepreneur from Sunderland took control of the club. 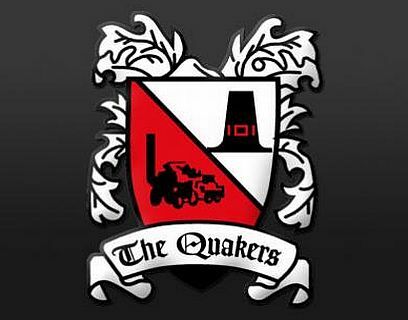 Darlo’s history, for a club of previously modest means, had been a fascinating one. Formed in 1883, the Quakers won the Durham Challenge Cup just two years later. In 1908, they joined the competitive North Eastern League, and a decade after turning professional, accepted an invitation to join the Football League. In 1955, they made history by playing the first floodlit FA Cup game between Football League Clubs, and were again a quirk of FA Cup folklore, when they became the first knocked-out team to reach the next round, the ‘lucky losers’ who took the place of the otherwise engaged Manchester United. The North-East club continued their proud cup history, reaching the FA Cup’s last 16 in 1958, and the Quarter-Finals of the League Cup a decade later. Indeed, despite a brief drop to the Conference in 1989, Darlo’s league status was almost tiresomely stable, and manager Brian Little achieved successive promotions to haul them back up to English football’s third tier in 1991. Under Reynolds, though, things soon fell apart. The Darlington Arena, expensive to maintain, and rarely more than 10% full, and failed attempts to secure in big-money buys like Faustino Asprilla and Paul Gascoigne left Darlo in financial dire straits. As early as 2004, the Northern Echo ran a story entitled ‘Turn up or the Quakers will die’. In 2012 they did, though in typical Darlo fashion, they took the cup by storm, lifting the 2011 FA Trophy, before bowing out. But the story doesn’t end there. I lived in County Durham for four years, around the time of Darlo’s fall from grace, and in a football mad area, the reformed Darlington 1883 are giving the good people of Darlo something to cheer about. Their current home at Heritage Park, Bishop Auckland is a far cry the Darlington Arena, but that’s absolutely for the best. Darlington are sustainable, majority fan owned and recently thumped Ossett Town 5-0 in the NPL Division One North. The future’s bright, and it’s refreshingly Reynolds-free. As disputed as the validity and necessity of FC United of Manchester’s existence is the question of whether they are indeed a Phoenix Club. Sides like Darlington 1883 and A.F.C. Wimbledon were borne out of a club’s disappearance, or their Pickfords-style removal to a new home many miles away. F.C. United, meanwhile, were not born from the desire to see 11 lads representing their city, rather more from disillusionment with a Manchester United hierarchy which had detached itself from the club’s matchgoing fans. Whilst Phoenix clubs are generally run with the fans’ prioritised – as every club should be, FC United have been key in revolutionising what a football club’s structure can be. In the 2009-10 season, they offered a ‘Pay what you can afford’ Season Ticket policy, an approach also taken by Scarborough Athletic. When Saturday Comes rightly praised FC’s ticket-pricing strategy as an “innovative approach to an often sensitive issue…provided by an elected, and therefore fan representative, board – making the game more accessible to supporters in the process”. But FC’s model goes deeper than that. The club’s manifesto includes clauses such as “the board will be democratically elected by its members” and “the Board will strive wherever possible to avoid outright commercialism”. Considering the ethos FC are implementing off the pitch, what they’re doing on it might seem secondary. But having watched the club semi-regularly since their formation in 2005, I can assure you that it’s just as joyous and uplifting. On a 2009 away day at Frickley Athletic, I witnessed F.C. fans held onto the match ball for an impromptu second-half terrace kickabout, go utterly ballistic for a routine away win, and respond to a home fan bizarrely exposing her breasts with some witty, ridiculous impromptu chants. Without our phoenix clubs, many football fans wouldn’t have half the great footballing anecdotes which we do. To those who resurrect a club, I say thank you. The phoenix will continue to rise. Many thanks to Dave for this two part series. Posted on February 23, 2015, in Opinion and tagged Darlington 1883, Darlington FC, FC United Of Manchester, Featured, Scarborough Athletic, Scarborough Town. Bookmark the permalink. Leave a comment.